When we talk about bedrooms for boys, what comes to mind could either be character themes, cars, music, nautical, travel or sports themed. But despite the limited bedroom themes for boys, there are actually a thousand ways to decorate a bedroom with the same theme. One of the most famous designs is sports bedrooms which can be decorated with balls, posters of their favorite sport teams and others. 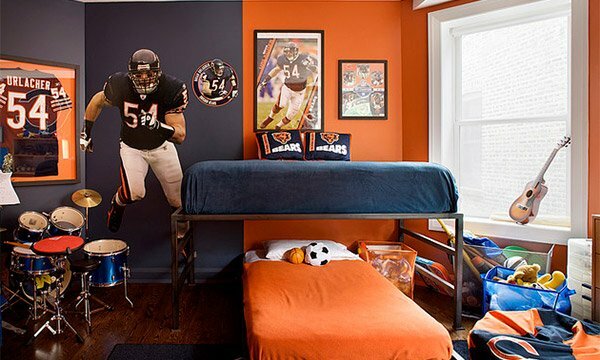 Today, we will be showing you a list of sports bedroom ideas. Feast your eyes on different versions of the bedroom which will surely give you ideas on what you can do with your own bedroom if you have decided to have one with a sports theme. Take a look at what else you can do aside from adding beddings that have sports inspired prints on it. 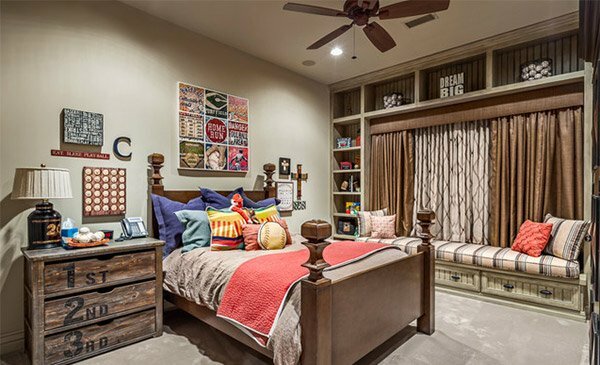 This bedroom is obviously owned by a boy who doesn’t just love sports but also music. The colors in the bedroom are great and looked even better with the striped fabric for the bed and the curtain. This is designed for a vacation home for a family from New York. The huge mural in black and white looks perfect in the room. The idea of framing numbers is good with a poster of sports equipment. The chair on the side with peeling paint also looks great in it. 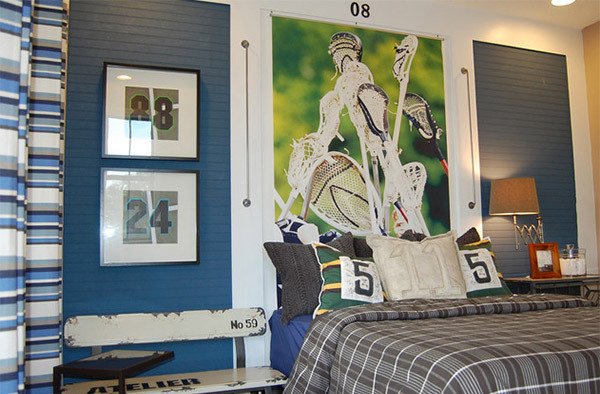 A Pottery Barn Teen bedding fitted into this vaulted ceiling bedroom with sports inspired wall decals. 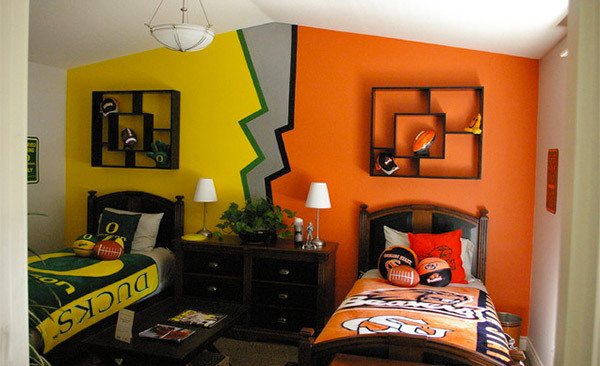 If you want a simple sports themed bedroom, this one would be good for you. Simply get covers that are sports themed and place a framed uniform. Ball shaped pillows, a silhouette artwork of players and a colorful carpet- all these complete the look of this bedroom. Soccer ball chairs are one good feature in the room. Also, the curtains in plain white cotton pique blend combined with black and white stripe for the curtain looks cute. The scoreboard on the headboard is a head turner. It really turned this room into a teeny-weeny sports arena! For two athletic boys with different passion for sports. The varying colors on each side seemingly create a territory for each one. A Yankees fan bedroom with a custom bed and nightstand, cork flooring, mirrored wall section, and toe-kick lighting on bed for a floating effect. 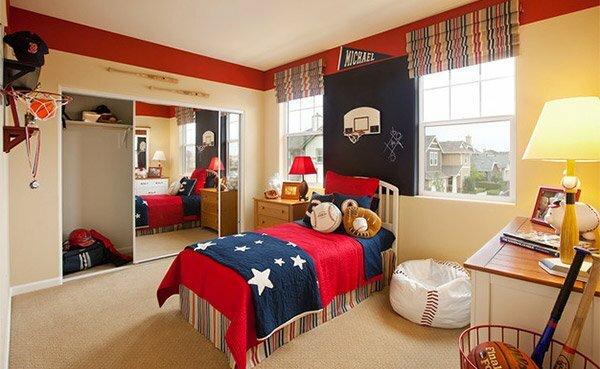 A traditional bedroom with sports theme integrated into it. We love the idea of placing ordinal numbers on the drawers! 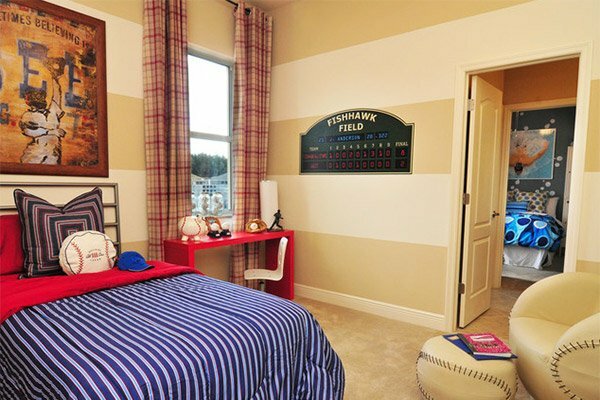 A bedroom designed by loving parents for their son who is obsessed with ball. They even did the ball murals and everything else in the bedroom. A subtle application of sports accessories but still managed to get the look. 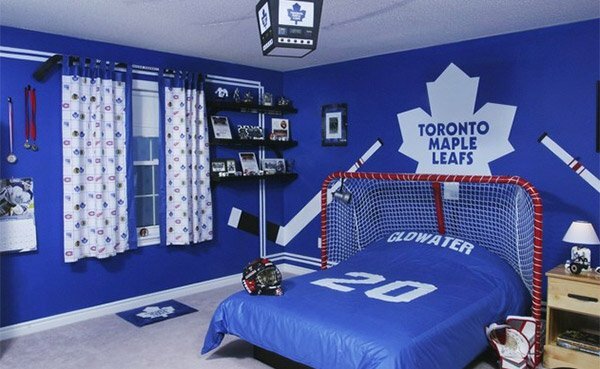 A bedroom in blue that seeming shouts “Hockey Time!” because of all the Maple team decors on it. You would certainly get some inspiration from the above bedroom designs that are sports inspired. 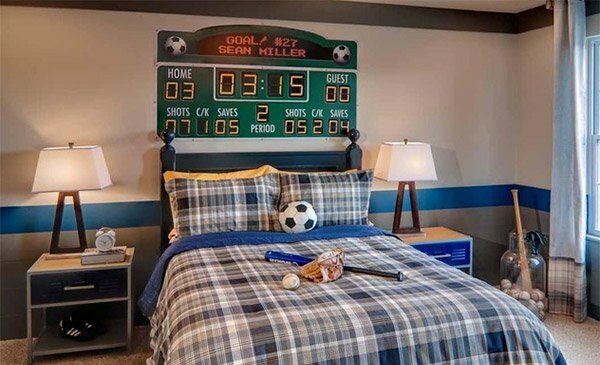 If you are a teenager who want to get a bedroom with this theme or a parent who is planning a sports themed bedroom for a little boy, this list is perfect for you. But if you are looking for more bedrooms for boys, you can check on bedrooms for teenage boys.